Despite Niger's exit, coach Gernot Rohr is leaving the Africa Cup of Nations with a great deal of satisfaction. The German arrived in South Africa aiming to do better than last year's outing in Equatorial Guinea and Gabon. A goalless draw against DR Congo sandwiched by losses to Mali and Ghana may not count as success if you are Ghana or Ivory Coast. But the point the Menas gained from the DR Congo game was enough to make this campaign better than last year's. However, they failed to score a single goal this time round. William Tonji Ngounou's strike against Tunisia is, therefore, still Niger's only Nations Cup finals goal in six matches. "We must try to be more efficient in attack because we didn't score a goal," Rohr said. "So let's work offensively, let's try to find new players who are able to score." The German coach also bemoaned some of his players' lack of fitness due to a lack of regular football. "I had four players without clubs and so it was difficult for them to play three games in nine days." 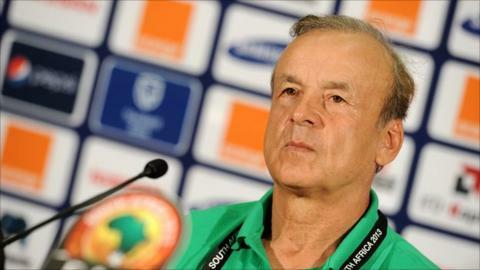 Rohr indicated that he wants to continue in the job after the Nations Cup and is already planning for the future. "I'm here for two years and only started four months ago," he said. "I want to help develop football in the country with an academy for the youngsters and with good training for the players to help them find good clubs where they can progress." Just two of the 23-man squad are playing for European clubs - striker Ngounou is in the third tier of Swedish football while Mountari Amadou is in the reserves with French second division side Le Mans. Striker Moussa Maazou, who has played for several clubs across Europe and is now with Tunisia's Etoile du Sahel, thinks Rohr is doing a good job. "We've learnt a lot of things here; before we just played the long ball and now we keep the ball down more," he said. "The coach has changed a lot of things in the team and I hope that's going to continue." Next up for Niger is a trip to play neighbours Burkina Faso in a 2014 World Cup qualifier in March.